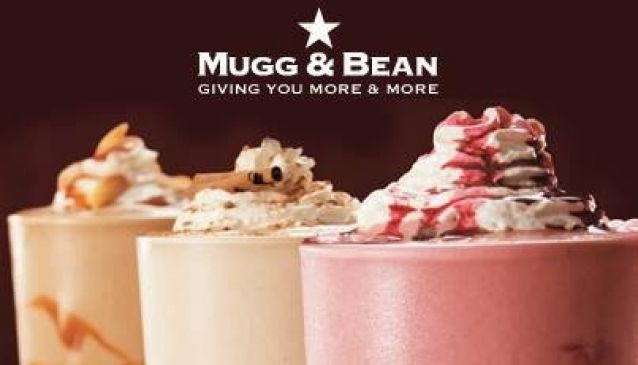 Mugg & Bean, part of the franchise originating from South Africa, is a great place to stop by for a delicious cup of coffee or for a bite to eat be it breakfast, lunch or supper. Their generous portions of food from their fresh muffins to their gourmet burgers are sure to fulfil your appetite. Their menu boast a wide selection of dishes for any occasion; muesili, full English breakfast, croissants, burgers, pies, salads, waffles, flapjacks or a slice of cake. Their milkshakes, smoothies and fruit freezes are a great treat on a hot day. Mugg & Bean provide a warm environment with their stylish décor and the constant aromatic smell of fresh coffee. Mugg & Bean is great for a meeting with business colleagues or a bite to eat with family or friends after tackling a day of shopping.